Feb. 7, 2017 – New York Geothermal Energy Association (NY-GEO) leaders, members and supporters applauded Gov. 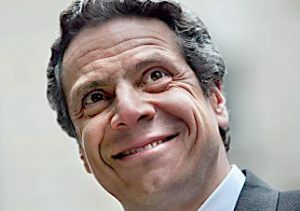 Andrew M. Cuomo’s proposed program to rescue geothermal jobs in New York State. The plan provides $15 million for geothermal heating and cooling rebates to stimulate the clean energy economy. According to NY-GEO, over 1,000 New York jobs in the industry were put at risk on Dec. 31 with the sunset of a 30% federal tax credit. The Geothermal Exchange Organization (GEO) is working toward reinstatement of those credits (see lead article). Cuomo had been urged to act by NY-GEO and a wide-ranging coalition of environmental organizations, local elected officials and geothermal businesses. The governor’s announcement comes as part of a comprehensive draft Renewable Heating and Cooling Policy Framework that he released on February 7. Developed by the New York State Energy Research and Development Authority (NYSERDA), the program allocates $15 million over the next two years to support geothermal installation rebates of $6,000 for an average-size home. Geothermal is one of the least expensive ways to heat and cool, but upfront costs of installing thermal exchange pipes below the frost line is a barrier for many businesses and homeowners. Last November, Cuomo vetoed a geothermal tax credit bill which had been passed overwhelmingly by the Legislature in June. His veto message stated his general support for geothermal installations as he encouraged consideration of incentives, as a revenue impacting item, in the budget process. Cuomo’s action puts New York squarely at the forefront of state action on renewable heating and cooling. Maryland, Iowa, South Carolina, and New Hampshire have all embraced initiatives, but none are as robust as New York’s. In addition, the governor’s Policy Framework lays out an exciting path forward for New York’s home and building owners to break free from the volatile costs of fossil fuels. The NYSERDA framework, the “Renewable Heating and Cooling Policy Framework: Options to Advance Industry Growth and Markets in New York,” sets out policy options and market-based solutions for the next few years, and identifies approaches for longer term action. Interested parties are invited to comment on the framework. More information on the framework policy is available here. The framework also explores methods to implement renewable heating and cooling mandates for public buildings, new construction, and renovation. NYSERDA will work with stakeholders and launch renewable heating and cooling programs in 2017 upon approval by the Department of Public Service, as part of the Clean Energy Fund. Once approved, NYSERDA expects to offer the rebate program in the Spring. NYSERDA, DPS, and the New York Power Authority will be collaborating to advance the framework.